Do you want a liquid soap line that fits your market’s needs? We can develop your own liquid soap line to answer to your clients’ needs. 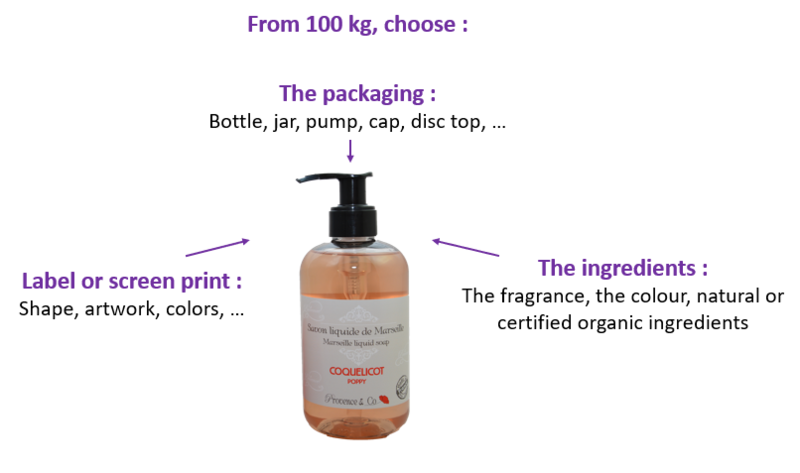 We can create, in collaboration with the client, his own liquid soap range with personalized fragrances and colours. He can also choose a shape of bottle and labels with the company logo and colours. Most of the time, our clients supply us with their labels; however it is possible to have them made by our suppliers. The private label liquid soap allows our clients to complete a bath product line and keep the same fragrances, colours, and brand identity. We can make up for our clients the cosmetic file to have new products that will be on the market in accordance with the law. We can take care of the paperwork for our clients: registration of formulas on CPNP, writing of the Product Information File, tests in laboratory, etc. to have the products following with the European laws. Reactivity, flexibility, partnership, are the keys of our success in the soap and cosmetic industry.